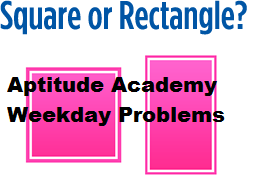 Consider that a square and a rectangle have the same area. Now if the perimeter of the square is x1 and the perimeter of the rectangle is x2, then which of these relations holds true ? Consider a square and a reactangle. Lets say that their areas are equal and are 16 sq.cm . So the sides of the square will be 4 cm each. And lets say the side of the rectangle is 2cm height and 8cm wide. However if you calculate the perimeter of the rectangle, i.e x2 = 8 + 2 + 8 + 2 = 20cm.